On the first true day of the arctic thaw, with the sun shining in the sky and a warm breeze (OK, maybe that’s a bit of an exaggeration) in the air, I found myself on Michigan Avenue in need of a snack. My rigorous excursion of window-shopping had left me feeling famished, and I knew just the solution. 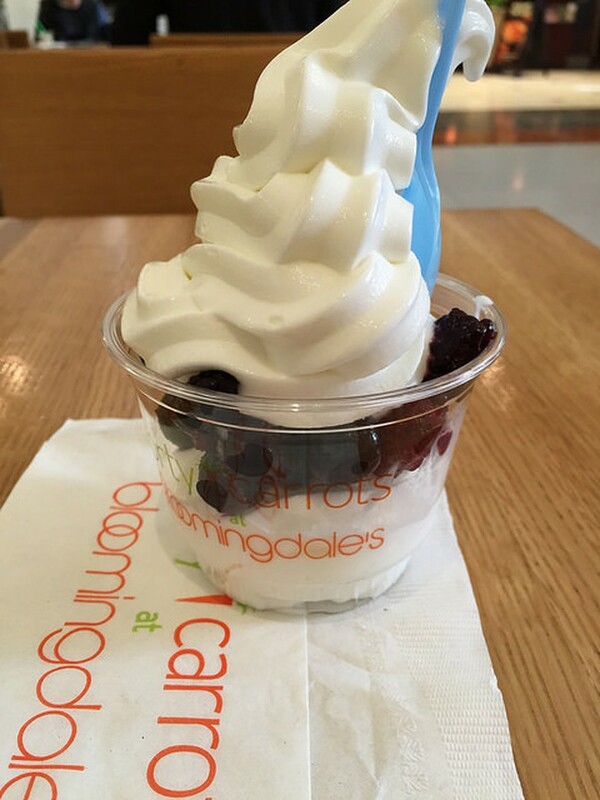 Forty Carrots, the iconic New York Bloomingdale’s frozen yogurt and natural food restaurant, has an outpost in the Chicago Bloomingdale’s. When I found out a few weeks ago, I simply could not wait to go. Fans of the New York branch may be slightly disappointed by the lack of atmosphere in the Chicago location, but the yogurt tastes just the same. The original tart still bursts with sunny flavor. Topped with mixed berries, the concoction feels like a vacation, but also vaguely healthy (I usually justify it with the phrase, “Hey, shopping burns a lot of calories!”). The yogurt tastes tart without being aggressive, and creamy without crossing into the too-indulgent ice cream territory. Although I didn’t eat a proper lunch in the restaurant, the menu is virtually the same as the New York location and packs healthy-but-substantial sandwiches, salads, and entrees alongside smoothies, juices, desserts, and of course, frozen yogurt. Unlike the New York location, which always hums with activity, Forty Carrots Chicago provides the perfect quiet oasis away from the hustle and bustle of Michigan Avenue. It’s a great place for lunch or for much-needed replenishment after a long day of shopping. Unfortunately, like the New York store, there is no seating for those who order only frozen yogurt; seating is reserved for guests ordering lunch. I had to go down a floor to the general restaurant level of the mall to find a table. Although the Forty Carrots Chicago doesn’t quite capture the bright style and happening atmosphere of the original New York location, it has its own charm, and the yogurt is perfection. I think it’s safe to say I’m already planning my next trip. Hours: Mon-Sun, 10 a.m.–5 p.m. The Palate is made up of a community of staff writers, photographers, designers, and contributors who share one love: food. For more information on how to join, email uchicagopalate@gmail.com. General meetings take place 4th, 6th, 8th, and 10th weeks on Tuesdays at 6:30 p.m. in Cox Lounge. Join us for food, pitches, and yummy conversation!